Understand the phases of the Moon by observing the positions of the Moon, Earth and Sun. A view of the Moon from Earth is shown on the right as the Moon orbits Earth. Learn the names of Moon phases and in what order they occur. Click Play to watch the Moon go around, or click Pause and drag the Moon yourself. Explain why we see Moon phases. Relate Moon phases to the Moon's position. Name the phases of the Moon and list them in order. Understand what causes the phases of the moon as we see it from Earth. Students will work in small groups... (more) and as a whole group to create a model. Shortened Student Exploration Sheet where students will draw and name each phase of the moon. 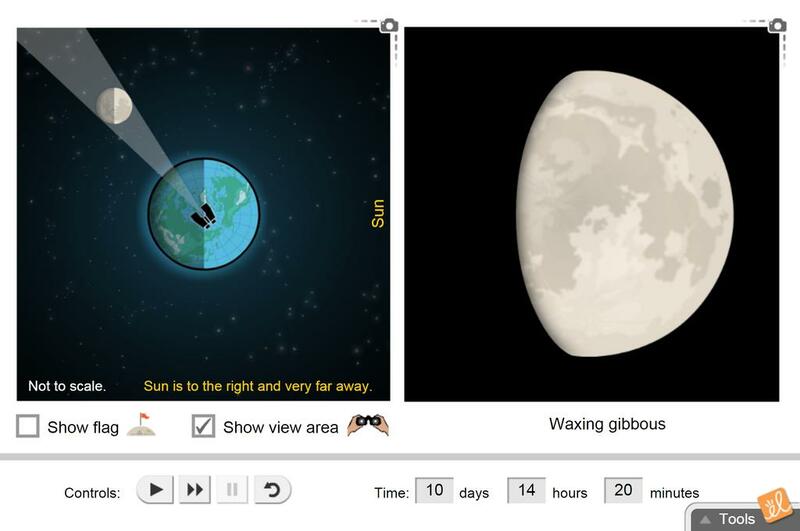 Use these Phases of the Moon Gizmo demo tips to help students understand: 1. that the Moon's rotation an... (more)d revolution periods are approximately equal and 2. why the space view and Moon views for the waning phases (ex. Waning Gibbous, Third Quarter, Waning Crescent) on the Gizmo do not match. This exploration sheet is a useful companion to the Gizmo and leads into students' modeling the phases ki... (more)nesethically. Fantastic description of the Moon Phases! Great to use as a visual for students. An alternative to the moon observation calendar! Use this each year to teach moon phases!! Great visual!! A wonderful gizmo that shoes the 2D geometry of the Earth, moon, sun system. Easy to see why we only see one face of moon. Excellent source for exploring moon phases!